What priceless artefacts were saved from the Notre Dame fire? A large number of Notre Dame's priceless artefacts were rescued by firefighters, who battled through the night to bring the blaze under control. Emergency services formed a human chain to get some of the most prized possessions out of the building, the Paris mayor said, but despite their best efforts, some paintings have been lost in the blaze. The French ministry confirmed some artworks will be transferred to the Louvre for the foreseeable future. Frank Riester, the French culture minister, said the relics would be taken today and tomorrow. It is believed some of the artefacts have suffered smoke damage and will need to be restored. Said to be the wreath of thorns placed on Jesus Christ's head at his crucifixion, the ancient relic was stored in the cathedral's treasury. French King Louis IX brought the relic, which is kept in an elaborate gold case, to Paris in 1238. The Mayor of Paris, Anne Hidalgo, said the crown had been moved to a safe place. The garment, said to have been worn by Louis IX when he brought the Crown of Thorns to Paris, was also kept in the cathedral. Ms Hidalgo confirmed that too was safe. One of the most easily recognisable features of the Gothic masterpiece was its stained glass rose windows, which are a treasured artefact in the building. Three rose windows, which date back to the 13th century, are in place on the north, south and west facades. 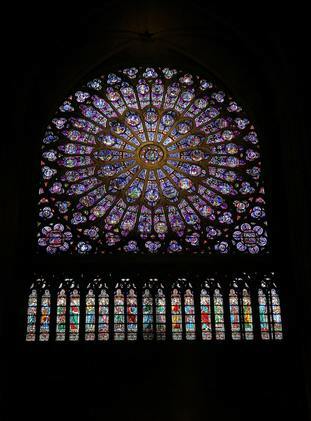 Notre Dame's north and west windows have been saved but it is unclear what extent the south has been damaged. Dozens of stone gargoyles are placed around the vicinity of the Notre Dame. It remains unclear what level of damage the exterior of the building has sustained. Why is Notre-Dame Cathedral in Paris so iconic?